White House Press Secretary Sarah Huckabee Sanders doubled down, saying it is "very biblical to enforce the law"
Attorney General Jeff Sessions speaks about religious liberty at the Orthodox Union Advocacy Center's annual leadership mission, June 13, 2018, in Washington. Attorney General Jeff Sessions on Thursday used scripture to bolster his full-throated defense of the Trump administration's policy of separating children from their parents at the border, saying that having kids does not give migrants immunity from prosecution — and found justification for his policies in the Bible. "Persons who violate the law of our nation are subject to prosecution. 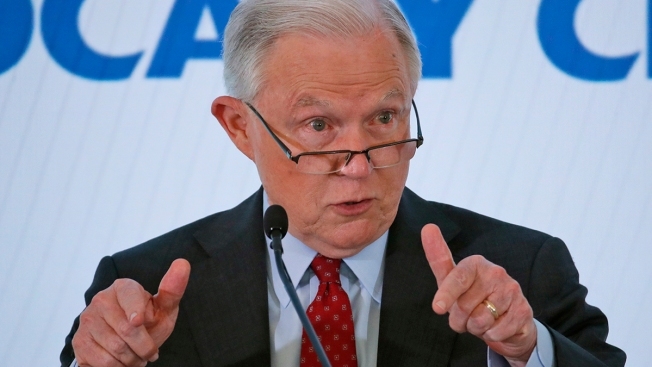 I would cite you to the Apostle Paul and his clear and wise command in Romans 13 to obey the laws of the government because God has ordained them for the purpose of order," Sessions said. He called on religious leaders to "speak up strongly to urge anyone who would come here to apply lawfully, to wait their turn, and not violate the law." Later Thursday, White House Press Secretary Sarah Huckabee Sanders doubled down, saying it is "very biblical to enforce the law." "That is actually repeated a number of times throughout the Bible," she said, responding to a question about Sessions' comments about scripture supporting the administration's policies.